There’s no shortage of information out there about the power of retaining customers (and growing their customer lifetime value – “CLV”), so I was curious to attend this session and see if there was anything new to learn on the topic. Turns out, there was! Adrath Albee, CEO & B2B marketing strategist for Marketing Interactions, is a wealth of information and offered some key points on retaining customers and growing CLV. I’ll try to share a few of them with you now. The core of Adrath’s session was built around how the subscription and recurring revenue business models that countless B2B and SaaS companies rely upon require a new sales and marketing approach. The days of locking customers into a contract and resting on your laurels are over (thankfully for all of us) and now we have the challenge of wooing customers constantly. It might be more work, but it also likely means more revenue, overall contentment and a better brand image. Isn’t that preferable to a wriggle-free contract that a customer is indentured to? Adrath and I agree it is. What keeps customers, even more than stellar products and services, is a top-notch customer experience. This isn’t news to any of us, but Adrath emphasized the roles of relevance and engagement in this pursuit. She repeated that customers should have memorable, enjoyable experiences at each stage and on every channel they go through. 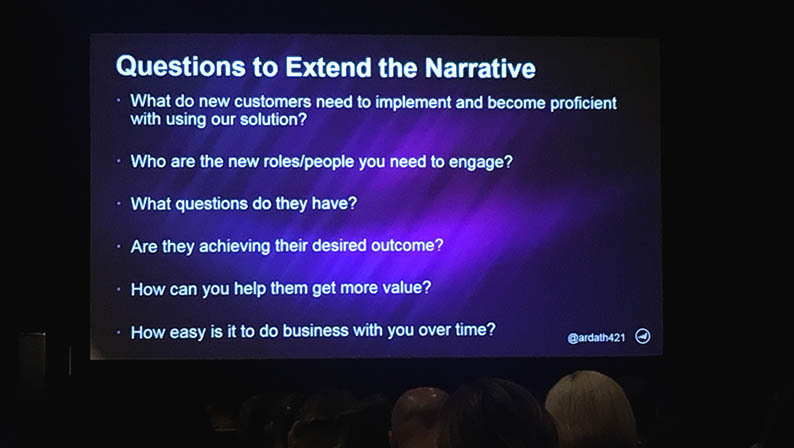 One of my favorite points she made was about building the “problem-to-solution story.” It makes so much sense, but sometimes marketers forget how much storytelling matters in a great experience – and what should be at the crux of it. Sure, your brand history has a time and place, but sharing your story doesn’t mean blathering on about your founders and humble beginnings. Instead, it means making the connection, in an artful way, between the problem(s) your customers have and the solution(s) you provide. This means becoming more conversational in your communications. Regularly reach out to customers, find new ways to incorporate the “problem-to-solution story” you’ve built and make sure your salespeople and customer service reps have the content they need to do the same. This will help you reach customers at every single stage throughout their lifecycle, with just enough of a nudge to move them toward the next one. It will also help keep them for the long haul. Adrath was delightful to listen to, and I feel more equipped after her session to “courageously” keep customers for life. Hopefully, you do too.